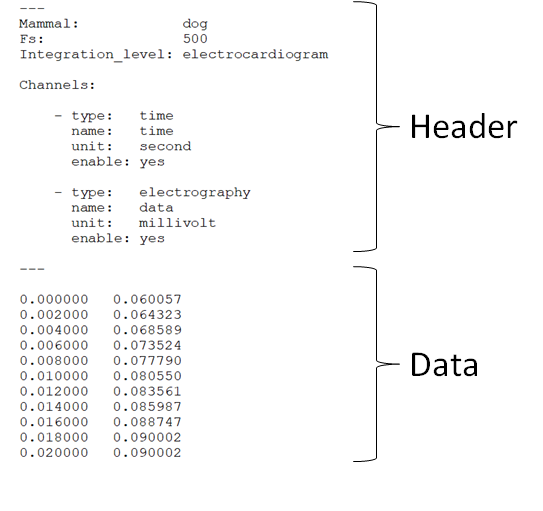 In this tutorial you will learn about how to prepare your data for importing them in PhysioZoo. Data samples are available here. The .txt and .mat files structures are specific to PhysioZoo whereas the WFDB follows the standard structure of WFDB powered by Physionet (physionet.org) with some additional fields in the WFDB header files. If you are experienced with WFDB then we recommend you use this format. When downloading PhysioZoo a set of examples (WFDB,.txt and .mat) are provided with the structure that is needed in PhysioZoo. You can use these as examples for formatting your own recordings. Integration_Level: ‘electrocardiogram’, ‘electrogram’ or ‘action potential’. enable: ‘yes’ or ‘no’. If you specify ‘no’ then this channel will be ignored when the file is loaded by the PZ Loader. Only specify ‘yes’ for the channels you want to use. In the case all or some of this information is missing from the Header then you will be prompted to enter it through the PZ Loader User Interface. ‘peak’: the location of the peaks (e.g. R-peak from an ECG time series). The peak locations can be specified in millisecond/second or index. ‘signal quality’: annotation on the signal quality. The signal quality annotations can be specified in millisecond/second or index. ‘time’: a time vector giving the position of each sample of another time series. An entry of type ‘time’ needs to be associated with another time series and must be in units of seconds or milliseconds. ‘interval’: the time interval between consecutive beats (e.g. RR time series). The interval length can be specified in second/millisecond or index. ‘beating rate’: the reciprocal of the interval in units of beats per minute (e.g. heart rate). ‘electrography’: the amplitude of an electrography time series (e.g. ECG). The electrography amplitude is given in microvolt, millivolt or volt. Thus only physiological units are allowed. Explanation of the structure of the different formats supported is provided below. Examples in all formats are also available in the ‘Examples’ folder provided with the PhysioZoo download. The Channels field is a Cell. 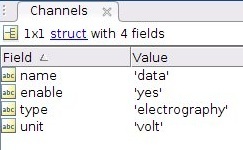 Each element of the Channel Cell will contain the following fields : ‘type’, ‘name’, ‘unit’ and ‘enable’. WFDB files (annotation or data) will be accompanied by a header (.hea) file specifying the relevant information for reading an annotation or data file. Refer to the WFDB documentation for that. To the standard WFDB format of the header, you will need to add one comment line at the end of the header and starting ‘#’ then followed by the mammal type and the integration level. For now PhysioZoo only supports the WFDB, text and Matlab formats. Most commercial softwares enable you to export your data in text format which you can then import in PhysioZoo using the PZ Loader (see here). Yes you can use the PZ Loader (see here) to import data which do not have a Header. You will use the PZ Loader User Interface to fill in the information needed and it will be opened in PhysioZoo.